The "In My Feelings" challenge has been taking over the internet and even Will Smith has decided to join in. If you have no idea what we are talking about, basically, people share videos doing the same exact same moves to the tune of Drake's hit Scorpion song In My Feelings. It all started with an Instagram user that is known as theshiggyshow. On June 29, the comedian shared a video of himself dancing (or "doing the shiggy," as he calls it) in the street and his moves perfectly fitted Drake's lyrics. People caught onto theshiggyshow's dance moves which have since gone viral, encouraging his 1.4 million Instagram followers, and has caught the attention of everyone including celebrities. 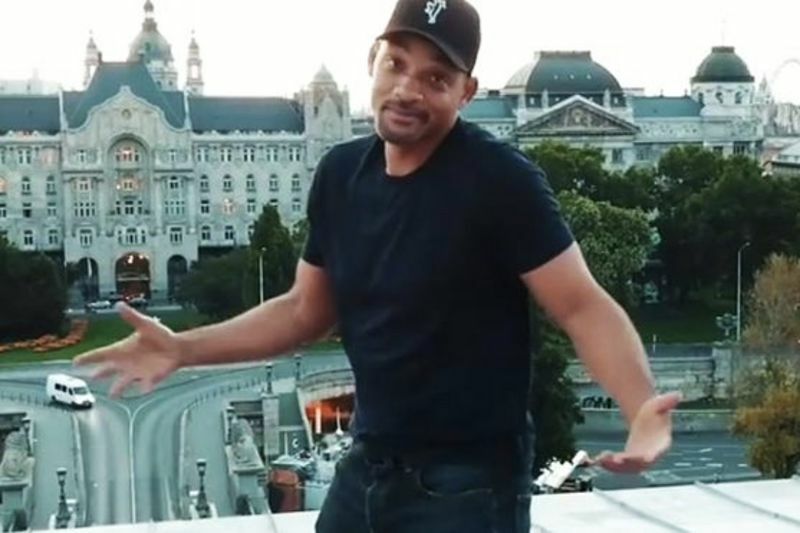 It's safe to say that Will Smith owned the "In My Feelings" challenge with his risky moves. Not only did he kill the dance, he also did it on top of a tower of the Chain Bridge in Budapest accompanied by one cameraman and a drone, just to give you a panoramic shot of the incredible view. When recounting the experience, Smith said: “I was TERRIFIED up there. That’s why my dance moves are all stiff!” He claims that the decision was completely spontaneous and that he didn't get any legal clearance to climb the tower beforehand. Shiggy spoke to Newsbeat about the viral trend and said that he is amazed at how far this dance has spread. After reviewing Smith's video, he said, "I like the fact that he took it to the next level, and plus he really took his time. It's like he risked his life just to do the challenge and that's crazy because I look up to Will Smith." Despite being impressed, Smith still didn't make it to Shiggy's number one spot as he sad that his favourite attempt was his mother's. Even though Will Smith seemingly stole the spotlight, climbing a tower and risking your life just to do a dance is a terrible idea! Stay safe people! Video: Have You Got The Fortnite Dance Moves? Video: Will Smith Is Releasing Music Again! Video: The Leaning Tower Of Pisa Is Indestructible! Video: Viral Videos That Made 2017 Great! Video: Will Smith Went From Slaying Robots To Kissing Them? Video: Could Your Dog Show You Up In An Internet Challenge? Video: Drake And Will Ferrell Show Off Handshakes And Roast Derozan!! Video: Canadian Downhill Legend Stevie Smith Remembered ' 'aggy's Reunion' Delivered Stoke In Spades As The Wildest Riders Drank Beer, Saluted With Saws And Shredded For Stevie!